President Enrique Peña Nieto has announced his decision to pardon Alberto Patishtán on Thursday, once reforms to the Federal Criminal Code approved by the Legislature enter into force. Today Wednesday [October 30, 2013] the Code’s reforms, passed by the Senate and ratified yesterday by the Chamber of Deputies, will be published in the Official Journal of the Federation. The second message reports: “This Thursday, the reform will enter into force, and I will pardon Alberto Patishtán Gómez.” These messages were sent out after a meeting lasting several hours between President Peña Nieto and justices of the Supreme Court of Justice of the Nation. On October 2, several senators proposed amendments to the Code so the President, on his own initiative, at the request of the chambers of the Congress or of the Supreme Court of Justice of the Nation, may grant clemency for any federal offence … when there are strong indications that the accused did not have access to adequate defence, when serious violations of due process are confirmed, or when the evidence is sufficient to prove the innocence of the person accused. Alberto Patishtán Gómez was immediately identified as a safe beneficiary of the measure; he is regarded as a political prisoner by virtue of the numerous irregularities that took place during his judicial proceedings, and, above all, because during his thirteen-year imprisonment, his innocence has been well documented both by his defence team, and by innumerable non-governmental human rights organizations. Nevertheless, the various bodies of the Judiciary of the Federation rejected all evidence and refused to reverse the judge’s original decision. The Tzotzil teacher was sentenced to 60 years in prison for participating in the killing of seven policemen, an event that took place on June 12, 2000, on a stretch of the Simojovel-El Bosque highway near the community of Las Limas in Chiapas. Among the irregularities in the judicial process is the fact of the undue influence on the Public Prosecutor’s investigations exerted by El Bosque’s Mayor, whose son was one of two survivors of the attack in June 2000, and who apparently identified Alberto Patishtán as a participant in the events. Also rejected were the testimonies of multiple witnesses that the social activist was in another place at the time of the crime, the existence of contradictory elements in the charges against him, and the absence of an impartial investigation to establish the truth of the allegations. Yesterday during a full session of the Chamber of Deputies, an amendment to the Federal Criminal Code was unanimously approved, with 422 votes. The amendment includes Article 97a so that, at the request of one of the two chambers of Congress or by his own decision, the President of the Republic can grant a pardon to a person when there are strong indications of serious violations of the convicted person’s human rights, a measure that, lawmakers stressed, directly seeks to benefit the teacher Alberto Patishtán Gómez. During the debate, members of PRD, PAN and Citizens Movement (MC) said that the amendment was unnecessary because Article 89 of the Constitution grants the Executive the power to grant pardons to prisoners convicted for federal crimes. Meanwhile, lawmakers from other factions argued that the reform not only reflects civil society’s concerns with the lack of fairness in the criminal proceedings against Patishtán Gómez but seeks to correct the lack of fairness that prevails in the judiciary system. The PRD Deputy Carlos de Jesús Alejandro said that more than 8,000 indigenous people are in prison because of violations of the right to due process, just for the lack of an interpreter or translator. “Of these 8,000, there are cases that stand out for obvious violations of due process; unfortunately, it is a routine practice throughout the Mexican State,” he said. Ricardo Monreal, MC coordinator, noted that although it is not the best way to secure the release of Patishtán Gómez, based on the Executive’s constitutional power to grant clemency, definitely an injustice is being corrected. 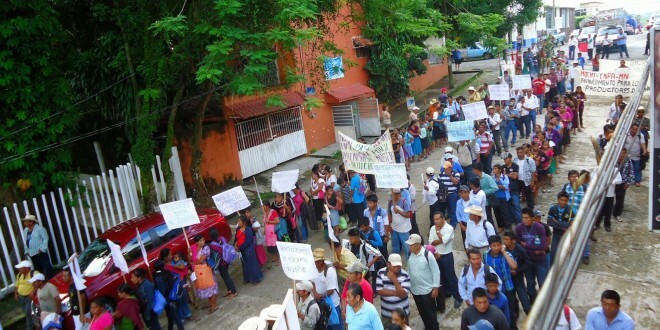 Tuxtla Gutiérrez, Chiapas – After the announcement made by President Enrique Peña Nieto that he will grant a pardon to Alberto Patishtán, the Governor of Chiapas, Manuel Velasco Cuello, said that the indigenous teacher should never have been imprisoned. “It is good news that Alberto Patishtán is going to be freed, but it must be said that Patishtán should never have been imprisoned,” declared Governor Velasco Coello. In this way, the Governor endorsed President Peña Nieto’s announcement of his intention to pardon the indigenous Tzotzil next Thursday. The Governor stressed that this momentous decision had been reached within the institutional framework of reforms to the Federal Criminal Code approved by both chambers of Congress which will be endorsed by the Federal Executive in the Official Journal of the Federation as anticipated by the President of the Republic. The Chiapas Governor pointed out that the pardon comes to correct an act of injustice. “No doubt the reconciliation is being paid, after many years of injustice. Now we must work to ensure that a case like Patishtán’s never happens again in our country,” he stated. Manuel Velasco’s remarks came after President Enrique Peña Nieto announced that this Thursday the reform opening the door to pardon Alberto Patishtán will go into effect; that same day he will grant clemency to the teacher imprisoned for almost 13 years. Mexican President Enrique Pena Nieto says he will pardon an indigenous teacher serving a 60-year jail term. Alberto Patishtan, 41, was convicted in 2002 for the murder of seven policemen in southern Chiapas state during the Zapatista rebel uprising. President Pena Nieto said he would pardon him under a new law which widens the scope of executive reprieves. Human rights groups have argued that Patishtan’s trial was flawed and beset by irregularities. President Pena Nieto said on his Twitter account that the pardon would come into effect on Thursday, when the new law comes into force. The law, which allows for leniency in cases in which the convict’s human rights are considered to have been violated, was passed on Tuesday. 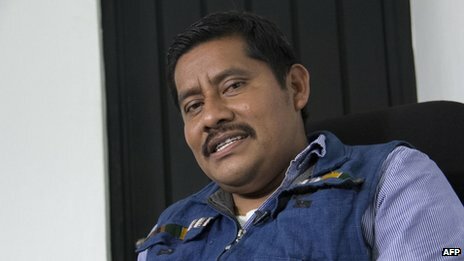 Patishtan, from the indigenous Tzotzil community, was arrested in 2000 following an ambush in Chiapas in which seven police officers were killed. He has always denied the crime and his lawyers allege that testimony that he was not at the scene of the ambush was not taken into account during his trial. His supporters say he was set up as a scapegoat at a time when Chiapas was the scene of a conflict between the Mexican security forces and the Zapatista National Liberation Army, a left-wing rebel group fighting for indigenous and land rights. Patishtan is currently in hospital in the capital, Mexico City, where he is receiving treatment for a brain tumour. Speaking to Spanish daily El Pais in March, he said he would not give up hope of being freed from jail. It will become effective on Thursday, when the Federal Criminal Code reforms regarding pardon, approved today by Congress, come into force. Mexico, DF. President Enrique Peña Nieto will pardon Alberto Patishtán Gómez on Thursday, once the Federal Criminal Code reforms enter into force, after they are published tomorrow in the Official Journal of the Federation. 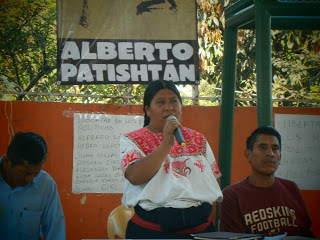 The teacher Patishtán has been imprisoned for 13 years in San Cristobal de las Casas, Chiapas. He was sentenced to 60 years in prison for killing seven policemen in an act which it has been demonstrated many times that he did not commit, because he was not even at the scene of the crime. It should be noted that the president announced the pardon after a prolonged three hour meeting with the ministers of the Supreme Court of Justice of the Nation, who last March refused to review his request for recognition of innocence. During the political and cultural action “Educating to Be Free,” organized by the National Coordinating Committee of Education Workers (CNTE) in support of Patishtán, which was held last night at the camp maintained by the dissident teachers at the Monument to the Revolution, Ramírez López said that the case of Tzotzil teacher, imprisoned for 13 years “for a crime he did not commit”, should be disseminated far and wide to increase the pressure for his release. He recalled that Patishtán Gómez was one of the people most concerned about the situation of inequality that was in his municipality. “He denounced the great injustices in El Bosque,” organized the community to call on state and municipal authorities to clarify the death of some people, and even ventured to ask for the dismissal of the then-mayor (in 2000), Manuel Gómez. The professor considered that the amendments to the Federal Criminal Code made ​​last week by the Senate so that the Congress can seek pardon in cases of injustice like Patishtán’s, and which were turned over to the Chamber of Deputies, are an option for his release. To mark the passing of 6 months since the brutal assassination of compañero Juan Vázquez Guzmán on 24th April, 2013, we are sending a request to write a letter in support of the ejidatarios, adherents to the Sixth Declaration of the Lacandón Jungle, from San Sebastián Bachajón, Chiapas, Mexico, whose dignified struggle continues. The following letter is ready to print out and send in protest against the dispossession of their lands and to demand justice for their murdered leader Juan Vázquez Guzmán. At the end you will find the names and addresses of some government officials it can be sent to. It is only necessary to add the date, the recipient and your name and contact information. You can of course write your own letter if you prefer. You may also wish to send or deliver the letter to your nearest Mexican government office, embassy or consulate, as well as to the media and other organizations. It is better to send the letter by post rather than email wherever possible. *Asunto:* El despojo de las tierras comunales de los ejidatarios de San Sebastián Bachajón, y el asesinato de su líder comunitario Juan Vázquez Guzmán. El 24 de octubre de 2013 marco la conmemoración del asesinato del líder Comunitario y defensor de los derechos humanos del ejido San Sebastián Bachajón, Chiapas, Juan Vázquez Guzmán, quien fue asesinado en la puerta de su casa, hace seis meses, el 24 de abril de 2013. Desde entonces no ha habido ninguna evidencia de algún tipo de investigación eficaz sobre su asesinato; tampoco los autores materiales e intelectuales del crimen han sido identificados ni sancionados. Parece que este es otro ejemplo de la impunidad que prevalece en el caso de los crímenes en contra de los pueblos indígenas en México. Este asesinato, junto con la represión que atraviesan los habitantes indígenas tseltales de esta comunidad, forman parte de una campaña de violencia para desplazar a los ejidatarios de sus tierras y territorios ancestrales, con el fin de construir un desarrollo turístico de super lujo. Deseamos expresar nuestras profundas preocupaciones por la falta de investigación de este crimen y por la campaña, actualmente en curso, de hostigamiento, despojo y criminalización que los tres niveles del gobierno, y sus aliados en las grandes empresas, están llevando a cabo en contra de los ejidatarios de San Sebastián Bachajón, con el uso de la policía estatal, las fuerzas militares y unos grupos paramilitares contratados localmente, una campaña que ha estado en marcha desde el año 2007. El 3 de noviembre de 2013, los ejidatarios denunciaron el riesgo del “desalojo violento en cualquier momento de nuestro banco de grava Nah Chawuk que fundamos recientemente como organización y ejidatarios de San Sebastián Bachajón para beneficio del pueblo en general.” Afirmamos su derecho como pueblos indígenas a establecer este banco de grava en su territorio, y hacemos responsables a los tres niveles de gobierno por cualquier daño que puedan sufrir los ejidatarios que trabajan allí. El juicio de amparo 274/2011 del índice del Juzgado Séptimo de Distrito en Tuxtla Gutiérrez, Chiapas presentado por el pueblo de Bachajón que va en contra de la privación arbitraria de sus tierras comunales a raíz de la detención masiva en febrero de 2011, y a favor de la protección de su territorio y los derechos colectivos, ha sido tratado con una preocupante falta de imparcialidad e independencia. Esto demuestra una terrible falta de respeto hacia los pueblos indígenas, y va en contra de los derechos establecidos en el Convenio 169 de la OIT sobre pueblos indígenas y tribales, y en la Declaración de la ONU sobre los Derechos de los Pueblos Indígenas, los cuales han sido firmados por el gobierno mexicano. Los ejidatarios han pedido a la Corte Suprema de Justicia de la Nación que ejerza su facultad de atracción del caso, así como han solicitado al Tercer Tribunal Colegiado en Tuxtla Gutiérrez que conoce del Recurso de Revisión 274/2013 que de acuerdo con sus facultades solicite al máximo tribunal del país que resuelve el amparo de los indígenas tseltales, por ello esperamos que el Alto Tribunal trate a los ejidatarios con la equidad y la justicia, como es su derecho. La represión que han sufrido los ejidatarios, como resultado de la resistencia y la defensa de su territorio y los recursos naturales de la zona, los ha obligado a llevar su caso el 26 de mayo de 2013 a la Comisión Interamericana de Derechos Humanos, con sede en Washington DC con el fin de salvaguardar sus derechos y la integridad de su territorio, y además para protestar contra la privación arbitraria de la vida de Juan Vázquez Guzmán. Insistimos en que es esencial y fundamental garantizar la seguridad y asegurar el bienestar de los que buscan la defensa de las tierras comunales de los pueblos indígenas en contra del saqueo y el despojo. Finalmente hacemos un llamado a la liberación inmediata de Alejandro Díaz Santiz solidario de la voz del amate. Una investigación exhaustiva y justa de los autores materiales e intelectuales del asesinato de Juan Vázquez Guzmán, y el castigo de los responsables. El respeto de los derechos humanos fundamentales de los pueblos indígenas tseltales de San Sebastián Bachajón, y las garantías para su seguridad e integridad. El respeto y garantía de su derecho al uso y goce pleno de su territorio. El respeto de su derecho a la libre determinación y la construcción de su autonomía. Que el Presidente del Consejo de la Judicatura Federal, Ministro Juan N. Silva Meza, garantice un juicio justo y un recurso efectivo al Ejido San Sebastián Bachajón en el desarrollo del amparo 274/2011 del índice del Juzgado Séptimo de Distrito en Tuxtla Gutiérrez, Chiapas para la protección del territorio indígena tseltal, que por segunda ocasión fue repuesto el procedimiento recientemente por el Tercer Tribunal Colegiado en Tuxtla Gutiérrez. Poner fin al saqueo y el despojo, el robo de bienes comunes, la militarización de la zona, y las amenazas y la violencia que se vive. La liberación inmediata de Alejandro Díaz Santiz. acontecimientos en la zona, y ofrecemos nuestro apoyo total a los ejidatarios de San Sebastián Bachajón y a la familia de Juan Vázquez Guzmán. Insurgentes Sur 2417, San Ángel. Álvaro Obregón. C.P. 01000, México D.F. Re: The dispossession of the common lands of the ejidatarios of San Sebastián Bachajón and the assassination of their community leader Juan Vázquez Guzmán. 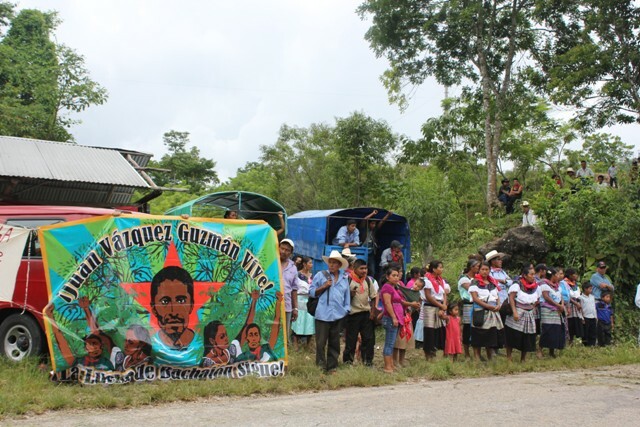 24th October, 2013, marks the commemoration of six months having passed since the community leader and human rights defender from the ejido of San Sebastián Bachajón in Chiapas, Juan Vázquez Guzmán, was shot down in the doorway of his home on 24th April, 2013. Since that time there has been no evidence of any effective investigation into his murder, and neither the material nor the intellectual authors of the crime have been identified or punished. It seems to be another example of the impunity which so often prevails in the case of crimes against the indigenous peoples of Mexico. This assassination, together with the repression being experienced by the indigenous Tseltal inhabitants of this community, forms part of a violent campaign to displace the ejidatarios from their ancestral lands and territory in order to construct a luxury upmarket tourist development. We wish to express our profound concerns at the failure to adequately investigate this crime and at the ongoing campaign of harassment, dispossession and criminalisation being conducted by the three levels of government, and their allies in big business, against the ejidatarios of San Sebastián Bachajón, with the use of state police and military forces and locally recruited paramilitary groups, which has been underway since 2007. On 3rd November 2013, the ejidatarios denounced the risk of “a violent eviction at any time from our gravel quarry, Nah Chawuk, which we recently opened as an organization and as ejidatarios of San Sebastián Bachajón, to benefit the people in general.” We assert their right as indigenous people to open this gravel quarry in their territory and will hold the three levels of government responsible for any harm suffered by those who work there. The judgement concerning the petition for amparo 274/2011 of the Seventh District Court in Tuxtla Gutiérrez, Chiapas, presented by the people of Bachajón against the arbitrary deprivation of their common lands following the mass arrest in February 2011, and in favour of the protection of their territory and collective rights, has been handled with a disturbing lack of impartiality and independence. This demonstrates a shocking lack of respect for indigenous peoples, contrary to their rights established under ILO Convention 169 concerning Indigenous and Tribal Peoples, and the UN Declaration on the Rights of Indigenous Peoples, both of which have been signed by the Mexican government. The ejidatarios have asked the Supreme Court of Justice of the Nation to address this case, and have also asked the Third Collegiate Tribunal in Tuxtla Gutiérrez to study the Appeal Hearing 274/2013 and, in accordance with its powers, to ask the highest court in the land to resolve the request for amparo from the indigenous Tseltales; therefore we expect the court to treat the ejidatarios with fairness and justice, as is their right. The repression being endured by the ejidatarios, as a result of their resistance and their defence of their territory and the natural resources of the area, forced them, on 26th May, 2013, to take their case to the Inter-American Human Rights Commission, based in Washington DC, in order to safeguard their rights and the integrity of their territory, and to protest the arbitrary deprivation of the life of Juan Vázquez Guzmán. We insist that it is essential and fundamental to guarantee the safety and security of those who seek to defend the communally held lands of indigenous peoples against plunder and dispossession. Finally we call for the immediate release of Alejandro Díaz Santiz, from Solidarity with the Voice of El Amate. We will continue to monitor closely any developments in the area, and to offer the ejidatarios of San Sebastián Bachajón and the family of Juan Vázquez Guzmán our total support. The inhabitants of this ejido in the municipality of San Cristobal de Las Casas, adherents to the Sixth Declaration of the Lacandón Jungle, have agreed to create an Ecological Community Police to defend their forests and land. It was agreed in the assembly that groups of 20 people armed with machetes will monitor the area of the ecological reserve of the people of Mitzitón, where signs will be posted warning that anyone who cuts down trees will be punished by the community. The guards will be relieved every 24 hours. It was decided to disregard the land rights of 23 families who “cut down trees illegally to do business”, led by Díaz López, Gómez Jiménez and Gómez Díaz, to whom the previous administration, two years ago, gave economic resources to relocate in the neighbouring municipality of Teopisca, and they were given three days to leave the ejido. At the meeting, dominated by traditionalist Catholics, which the executive secretary of the State Commission for Human Rights, Diego Cadenas Gordillo, attended as an observer, they admitted the re-entry of 40 evangelical families, who 14 years ago had separated from the group, a time when they were faced by differences. The representatives of these families -between ejidatarios and neighbours-, apologized to the meeting and their re-admittance was granted, after they agreed to pay a thousand pesos each, as a contribution for the time they had been absent. They promised to work and collaborate in what was agreed by the assembly, to “respect and care for trees and the ecology of the community, so they can take the firewood they need for domestic use, with the permission of the assembly,” as well as wood for their houses and fences, like the other residents. The ejido authorities explained that Mitzitón is made up of 1,813 hectares, of which 1,600, home to about 300 families, have been allocated to the ecological reserve. 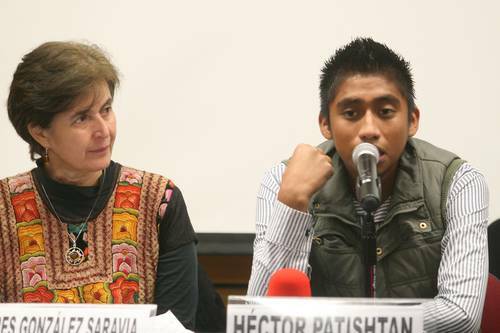 Although “it is perhaps not the most appropriate solution or the one we would have liked,” the possibility of securing a presidential pardon for the teacher Alberto Patishtán should be seen as an achievement of organised civil society, which may also help others who have been imprisoned unjustly, said the son of the Tzotzil activist, Héctor Patishtán. In an interview with La Jornada, the young man said that if there were real justice in the country, it would not even have been necessary for the Senate to reform the Federal Criminal Code concerning pardons, as they did on 23 October, in order to open the possibility that the Congress could ask the Head of the Executive to award the benefit of such action to those who have been the victims of serious procedural errors. “In the first place, we should not be in these circumstances, but the reform which they approved also has its good side, because it could set a precedent for many prisoners who are unjustly imprisoned,” he stressed. Héctor Patishtán said that a pardon is just one more route which we need to fully explore and walk, along with the possibility of an amnesty or an appeal to the Inter-American Court of Human Rights, the first option should not be rejected, as at this moment the priority is to free his father, who has spent 13 years in prison charged with the murder of seven policemen. “Seeing how things are, I believe that due to my dad’s delicate state of health, it is urgent to secure his freedom. Perhaps it is not the most appropriate solution, nor the one we would have chosen, but (a pardon) is fine,” and his release could be achieved in a matter of days, once the reform has been ratified by the Chamber of Deputies and published in the Official Journal of the Federation, explained the young man. Rogelio Rueda, a member of the Committee for the Liberation of Alberto Patishtán, agreed that the possibility of a pardon should be seen as a triumph not only for the indigenous teacher, but also for other victims of judicial abuse, and stressed that what is most important right now is to obtain his release by any means. “Inside myself I have been free since the first day. They tortured me psychologically, threatened me, but I never fell for the game of accepting blame.” It is this confidence that always makes professor Alberto Patishtán seem happy. “It is very sad that the judges did not admit my innocence, as if it is not important to them. They let themselves govern by obscurity,” he says. He radiates the clarity and interior peace of the good warrior. “I am aware that the deputies and senators are looking for some solutions to my case. Independently of what they want or are able to do, what interests me is that it be made clear that I am innocent. They have to give me freedom and honour,” he maintains on the patio of a house in Mexico City, where he has been staying for some weeks while he receives radiation treatment for a (benign) pituitary tumour operated on last year, and which has grown again. He does not seem alarmed by that, or by anything. Take the case of the paramilitaries that were prisoners because of the Acteal massacre. “I knew them all in El Amate, and some would tell you: ‘yes I participated,’ and others who denied it admitted that they were from the same group, that they cooperated in all that, that they acted. It surprised me that they would be released and not me. Why is that?” And he adds: “I am not the only one, I know other cases of evident injustice.” He has seen some of them leave, others remain. He has come to his own conclusions: “Justice must be above everything else; truth above any lie. And as my conscience is clean, I stay calm, secure about what I’m going to do. That motivates me to continue forward, and I can help those in the same situation,” adds the Tzotzil teacher, who was rewarded in 2010 by Bishop Samuel Ruiz García, for his work in defence of the human rights of indigenous prisoners in Chiapas with the distinction JTatic Samuel JCanan Lum. The Tzotzil professor says that he has never stopped struggling for his freedom, and that in doing so he participates in the struggles of the other prisoners who are there unjustly. As adherents to the Sixth Declaration of the Lacandón Jungle, dozens of Chiapas prisoners have maintained their innocence and achieved their freedom. Some were support bases of the Zapatista National Liberation Army. He comments about his “effect” on other prisoners. Now, relatives of indigenous Chiapas prisoners seek him, “people that I don’t know if I met, who are suffering bad treatment” in Islas Marías (where the former Chiapas Secretary of Government, Noé Castañón León, wanted to send him although he had to accept having him in a federal prison in Guaymas, Sinaloa, for several months, until Patishtán achieved his return to San Cristóbal de las Casas). I am Alejandro Diaz Sántiz, unjustly imprisoned, from “Solidarity with the Voice of El Amate”, adherent to the Sixth Declaration of the Lacandon Jungle of the EZLN, held prisoner in cereso no. 5 in San Cristobal de las Casas, Chiapas, 24th October, 2013. The rulers do not care about justice, they are only worried about their own wellbeing, while the prisons are filling up with people who have committed no crimes, violating families without reason or motive. Today, October 24th, I complete 33 years of the life that God has given me; the saddest part is not being able to celebrate with my family, instead of being happy and content I am just filled with anger at this unjust imprisonment. Today, October 24th, also marks 6 months since they murdered our compañero Juan Vázquez Guzmán for defending the ejido of San Sebastian Bachajón. Now during the second visit made by the Governor Manuel Velasco Coello, here in prison No. 5, which took place on the 4th of July, he pledged to seek the means or links to the authorities of Veracruz to obtain my freedom, which so far has not happened, so once again I demand my immediate release. Meanwhile, I also demand the freedom of my compañeros from the ejido of San Sebastian Bachajón, adherents to the Sixth Declaration of the Lacandon Jungle, Antonio Estrada Estrada who is imprisoned in cereso No. 17 in Playas de Catazaja, and Miguel Demeza Jiménez who is imprisoned in cereso No. 14, El Amate. At the same time, I invite the people of Mexico to join in the call for justice and freedom for the political prisoner Alberto Patishtan Gómez, for, as we see, once again his right to justice is forgotten. 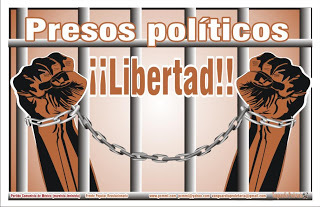 Imprisoned unjustly, “Solidarity with the Voice of El Amate”, Alejandro Diaz Sántiz, prison No. 5, San Cristobal de las Casas, Chiapas, October 24, 2013. Raul Zibechi: Is it possible to defeat Monsanto? IS IT POSSIBLE TO DEFEAT MONSANTO? Diverse movements and multiple actions, both programmed and spontaneous, through denunciations, and all types of mobilizations that converge against a corporation that represents a serious danger to the health of humanity are besieging one of the world’s largest multinationals. Establishing the variety of existing initiatives and learning about them can be a way of comprehending a new kind of cross-border movement, capable of articulating activists all over the world in concrete activities. The encampment at the gates of the seed plant that Monsanto is building in Malvinas Argentinas, 14 kilometres from Córdoba, is one of the best examples of the mobilization underway. The multinational plans to install 240 silos of genetically modified corn seeds for the purpose of arriving at 3.5 million hectares planted. The plant will use millions of liters of agro-chemicals for the care of the seeds and a part of the effluents “will be released into the water and soil, provoking grave harm,” as Medardo Ávila Vázquez of the Network of Doctors of Fumigated Peoples maintains. The movement against Monsanto won victories in Ituzaingó, a Córdoba barrio near the place where they intend to install the corn seed plant. The Mothers of Ituzaingó (movement) was born there ten years ago. The movement discovered that 80 percent of the children in the barrio have agro-chemicals in their blood and that it is one of the causes of the deaths and deformities in their families. In 2012, for the first time they won a lawsuit against a producer and a fumigator, (who were) condemned to three years of conditional incarceration without going to prison. The encampment at Malvinas Argentinas is now one month old, maintained by the Struggle for Life Malvinas Neighbours Assembly. They achieved winning the support of a good part of the population: according to official polls, 87 percent of population want a popular consultation and 58 percent reject the multinational’s installation, but 73 percent are afraid to express an opinion against Monsanto for fear of being harmed (Página 12, 09/19/13). The campers resisted an attempt to evict them from the construction union (UOCRA) that is adhered to the CGT, and harassment from police and provincial authorities, although they have the support of the mayor, the unions and the social organizations. They received support from Adolfo Pérez Esquivel, a recipient of the 1980 Nobel Peace Prize, and from Nora Cortiñas, of the Mothers of the Plaza de Mayo. They were able to paralyze the plant’s construction by impeding the entry of trucks. The siege of Monsanto also arrived in the small tourist town of Pucón in southern Chile, on Villarrica Lake, where 90 of the transnational’s executives, coming from the United States, Argentina, Brazil and Chile arrived at a luxury hotel to hold a convention. Environmental groups, cooperatives and Mapuche collectives from Villarrica and Pucón dedicated these days to “exposing” the presence of Monsanto in the country (El Clarín, 10/13/13). In the first place, the mass actions in which tens of thousands participate are important, because they permit demonstrating to the general population that the opposition to corporations like Monsanto, and therefore to genetically modified foods, is not a question of minority criticism. In this sense, worldwide days, like that of October 12, are indispensible. The mobilizations of small groups, dozens or hundreds of people, like the ones that happen in Pucón and in Malvinas Argentinas, as well as in various mining undertakings in the Andean Cordillera, are as necessary as the big demonstrations. On the one hand, it is a way to be permanently present in the media. Above all, it is the best path for forging militants, besieging the multinationals and publicizing criticisms of all their business initiatives. It is in the small groups where ingenuity usually flourishes and within their breasts the new forms of being able to innovate with political culture and protest methods are born. There is where community ties and strong ties between people can be born, which are so necessary for deepening the struggle. After one month of camping in Malvinas Argentinas, the demonstrators “began to put up adobe walls; they constructed a clay oven and started an organic vegetable garden by the side of the route” (Día a Día de Córdoba, Octubre 13, 2013). In the third place, it is fundamental to support the denunciations with scientific arguments and, if possible, to involve authorities in the matter. The case of the Argentine biologist Raúl Montenegro, Alternative Nobel Prize in 2004 (Right Livelihood Award), who committed himself to the cause against Monsanto and to the Mothers of Ituzaingó, shows that the commitment of scientists is as necessary as it is possible. The fourth question is the importance of the opinions of the common people, distributing their beliefs and feelings about genetically modified foods (or any initiative of the extractive model). The subjectivity of the people is accustomed to showing traits that do not contemplate the most rigorous academic studies, but their opinions are just as important. Finally, I believe that it’s necessary to place within view not only one multinational like Monsanto, one of the worst of the many that operate in the world. In reality, this is just the most visible part of a model of accumulation and development that we call extractivism, which turns around the expropriation of the commons and the conversion of nature into merchandise. In this sense, it is important to emphasize what there is in common between the transgenic monocrops, mining and real estate speculation. The latter (real estate speculation) is the mode that extractivism assumes in the cities. 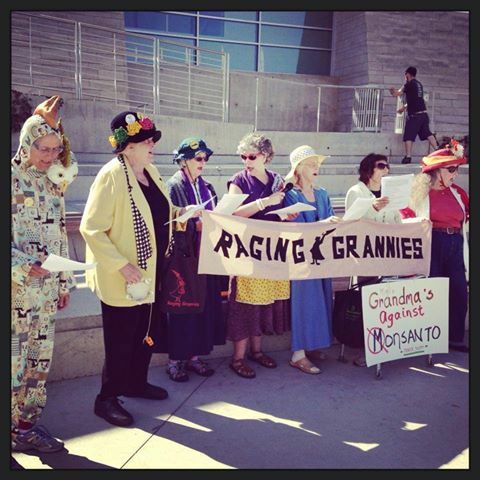 If we defeat Monsanto, we can conquer the other multinationals. Saltillo, Coahuila. Bishop Raúl Ve­ra López said it is unbelievable that while the justice system released the drug lord Rafael Caro Quintero and the paramilitary protagonists of the Acteal massacre, and allowed the Frenchwoman Florence Cassez, condemned for kidnapping, to leave Mexico, the Tzotzil professor Alberto Patishtán continues to be imprisoned for a crime which he did not commit. “The process of justice is wrong. 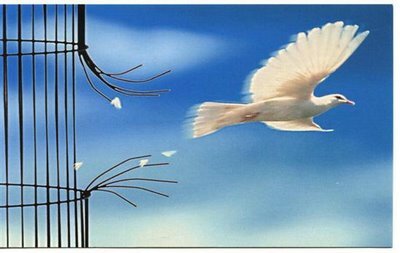 An honest teacher, who has truly been an apostle in the prison, is still kept there. It is a structural problem of the justice system,” he said. Concerning the tax reform which the government of Enrique Peña Nieto is seeking, he said it aims to gather resources to pay miserable pensions to thousands of workers who will be affected by the short contracts which the new labour legislation is proposing. 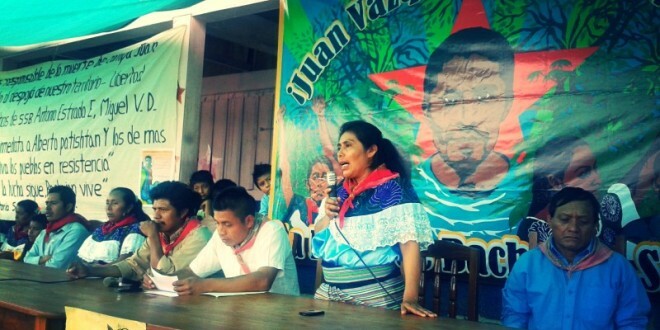 “Although the rulers do not like it, we will continue defending our territory because this is where we come from, and we are not leaving despite their repression and corruption” say the ejidatarios of San Sebastián Bachajón, who denounce the murder with impunity of their leader Juan Vázquez Guzmán, and request the intervention of the Supreme Court of Justice of the Nation to protect their rights and the integrity of their territory. With this clear message, the adherents to the Sixth Declaration of the Lacandón Jungle re-confirmed that their struggle continues, despite the brutal murder of their traditional leader, the social activist and human rights defender Juan Vázquez Guzmán, on 24th April, 2013, and the fact that neither the instigators nor the perpetrators of the killing have been identified or punished. They explain their struggle: “We fight to defend our territory from dispossession by the government to impose an ecotourist megaproject”. They warn that “the bad government” uses public forces, such as the state preventive police, the army, and the federal police, to terrorize communities and so imposes terror to achieve its goals. “We can see that the hand of the government has great aspirations for the natural resources of the ejido and wants to finish off the organization politically, because it does not want to have resistance, so that the people will easily hand over their land for the building of large luxury hotels, golf courses and aeroplane runways for wealthy tourists”, they stated on 9th September. “Our compañero Juan Vázquez Guzmán is an example of struggle and of love for his people, he gave his life for his people, he struggled for his people to be free from the oppression and the abuse of power of the bad government, he struggled to recover the territory which had been seized”, the Tzetzals confirmed. It has not been easy for the ejidatarios after the devastating murder. They have suffered relentless violence and repression from the 3 levels of government, and from paramilitaries supporting the PRI political party, since 2007. After Juan’s assassination, they received an avalanche of support, with pronouncements, letters and declarations issued from groups, collectives, human rights organisations and other representatives of national and international civil society. 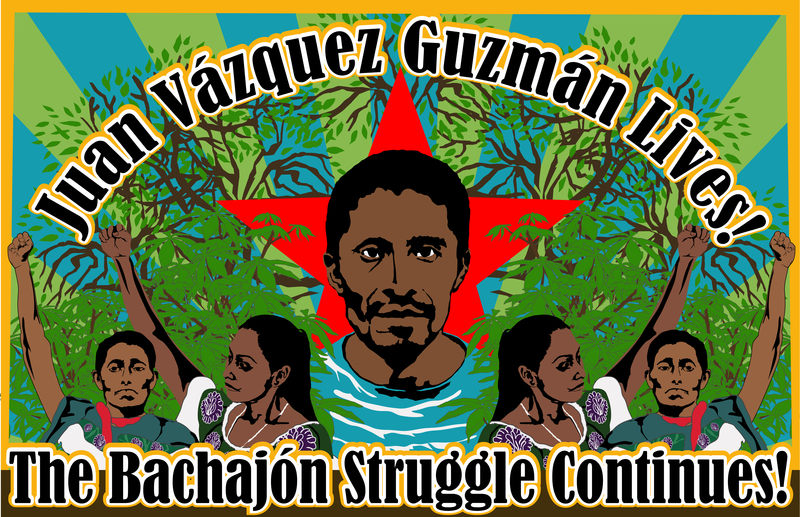 To coincide with Juan’s birthday on 25th June, the “Week of Worldwide Action: Juan Vázquez Guzmán Lives, The Struggle of Bachajón Continues” was organised, an international campaign co-ordinated and publicised by a worldwide network of solidarity groups. Honouring and keeping the memory of Juan is a powerful impetus to the people of San Sebastián Bachajón to continue in resistance, defending their territory in the ways he taught them; they have done this using several means: through one of their main tools of struggle – the roadblock, through symbolic actions asserting their right to live in their territory, through continuing to campaign for the release of their prisoners, through legal means by promoting their amparo, and through joining their resistance with that of other indigenous people throughout Mexico. “Our resistance”, they say, “is for dignity and autonomy, because we want to continue being who we are”. The Tzeltals handed out flyers in Spanish and English, for many tourists travel on this busy road. Through a megaphone they read their communiqué calling for justice not impunity, for respect for their territory, and declaring that they are “ready to give our lives for our mother earth and our struggle, just as our compañero Juan, heart of our struggle and our people, did”. The ejidatarios stated that Juan Vázquez Guzmán denounced the networks of corruption and complicities of the government “which aim to displace the people of San Sebastián Bachajón from their land and to dismantle our organization in resistance”. As the well-known case of Alberto Patishtán has demonstrated, Mexican prisons contain many indigenous prisoners detained unjustly on fabricated charges made in a language they do not understand, with their basic rights violated, and their due process not complied with. In April 2013, there were 3 Tzeltal prisoners from Bachajón, all of whom had been tortured to make them confess to crimes they did not commit, and all of whom, according to the Fray Bartolomé de las Casas Human Rights Centre, were imprisoned “to undermine the actions for the defence of territory that the ejido has been undertaking for several years”. There was great celebration, therefore, when one of them, Miguel Vázquez Deara, was released on June 26th, 2013, due to “violations of his rights to an adequate defence”. On 13th August, 2013, the prisoner Miguel Demeza Jiménez was granted an amparo (legal protection) in relation to the detention order against him, because, in the words of his lawyer, Ricardo Lagunes Gasca, “the detention order violates Article 16 of the Constitution, as the El Amate judge did not duly point out the foundation and the legal and logical reasons proving probable criminal responsibility”. “This decision”, the lawyer continued, “establishes that he has been wrongfully imprisoned for nearly three years”. The remaining prisoner, Antonio Estrada Estrada, filed a petition for amparo on 30th September 2013 against his sentence of seven years in prison, for the offences of assault and organised crime, on the grounds of violation of his human rights. During his detention Antonio was not granted the assistance of a lawyer and a translator who knew his language and culture, and he was tortured, to force him to sign an incriminating statement, by the same police officers who had arrested him, alleging that he had assaulted them. Miguel Demeza Jiménez and Antonio Estrada Estrada currently remain imprisoned, the first in El Amate and the second in Playas de Catazajá, and the campaign for their freedom continues. On February 2nd, 2011, local authorities evicted the ejidatarios of Bachajón from the toll booth at the entrance to the Agua Azul Waterfalls, the area where the government plans to develop, with multinational corporations, a luxury tourist complex to rival Cancun. At this time, 117 people were arbitrarily detained, and the authorities took possession of 2,590 square metres of the collectively owned lands of the ejido. This dispossession, their lawyer warned “is only the beginning of the plunder that is to come”. In order to legally prove their rights to this land, a representative of the ejidatarios presented a petition for amparo, against the arbitrary deprivation of their common use lands, before the courts in March 2011. After nearly two years, the petition was dismissed in January 2013, but the ejidatarios and their lawyer persisted, and the decision was overturned in May 2013. On July 22nd, the case of amparo 274/2011 came up before the same judge, José del Carmen Constantino Avendaño, who had dismissed it in January, and he again ruled against Bachajón. The ejidatarios denounced the judge as a corrupt crook “who sells his dignity and honour”, and continued to defend their amparo. On 1st August they filed an appeal for review against the decision, which is currently being processed. They also asked the Supreme Court of Justice of the Nation “to consider our amparo and protect our territory”. They cited as precedent the “protective decision” to grant amparo 631/2012 to the Yaqui tribe of Sonora, concerning the theft of the water from the Yaqui River by the state government through the Independence Aqueduct. On 17th and 18th August, 2013, the Tata Juan Chávez Alonso Seminar, convoked by the Zapatista Army of National Liberation (EZLN) and the CNI itself, a national meeting to relaunch the Congress, was held in San Cristóbal de las Casas. At this crucial gathering, members of over 32 indigenous peoples, nations and tribes from 19 states met to “recognize, support and encourage the struggle for autonomy and self-determination of all the peoples who make up the CNI”, because “the bad governments and transnational corporations” rely on “paramilitary groups to impose extractive megaprojects”. Among the 29 demands they issued was “the release of our imprisoned compañeros from the Tzeltal community of Bachajón, Chiapas, Miguel Demeza Jiménez and Antonio Estrada Estrada”. The assassination with complete impunity of indigenous leaders in resistance to the territorial plunder and displacement arising from neoliberal megaprojects is one of the established tactics of governments looking to destroy opposition. In Mexico, the community defender and environmental activist Noé Vázquez Ortiz was stoned to death on August 2nd, 2013, as he was preparing the ceremony to begin the 10th anniversary meeting of the of the Mexican Movement of those Affected by Dams and in Defence of Rivers (MAPDER), in the municipality of Amatlán de los Reyes, Veracruz. 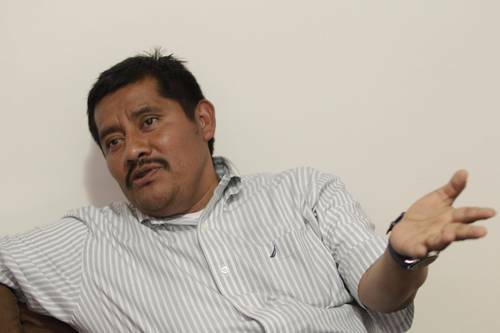 Héctor Regalado Jiménez, opponent of the wind-energy projects and sympathizer of the Popular Assembly of the Juchiteco People (APPJ), died on 1st August 2013 in the city of Juchitán de Zaragoza from the injuries from the six gunshot wounds he received on 21st July. Two Zapotec community leaders opposed to the Canadian silver and gold mining project at San José del Progreso in the south of Oaxaca were murdered in 2012; Bernardo Vásquez and Bernardo Méndez were both shot dead. In Chiapas, the indigenous leader from the municipality of Chicomuselo, Mariano Abarca Robledo, organiser of the communities demanding the closure of the barite mine operated by the Canadian mining company Blackfire, was shot dead in 2009. The list is endless. “The struggle of our people of San Sebastian Bachajón”, they told the National Indigenous Congress, “is to conserve our indigenous territory which we inherited from our ancestors, it is where we live, it gives us life and identity. We are defending our land with our lives if necessary, against the ambition of the government and of the lords of money who want to build luxury hotels, golf courses and runways for rich tourists, at the cost of the exploitation, marginalization and discrimination of our people; faced with the defence we have mounted against these projects the government has had only one answer: repression, imprisonment and death”. My name is Antonio Estrada Estrada and I am from the San Sebastián Bachajón Ejido, adherent to the Sixth Declaration of the Lacandon Jungle. I publicly denounce the federal public defender on the grounds that he violates all of my rights in that he does not appear on the days of my hearing and likewise the federal prosecutor in the same way who does not appear in my hearings, motives and reasons I do not know. I denounce in the same way the clerk or judge of this combined court in Playas de Catazajá, Chiapas, since he sentenced me to 7 years without investigating the offense of assault and organized crime that I am accused of, without having committed it. The victories obtained in the legal sphere by other peoples, such as the Yaqui tribe and the Wirrárika, give encouragement to the ejidatarios[i]. “This not only benefits them, but also other peoples,” says the lawyer of the Tzeltales. The ejidatarios of Bachajón continue the defence of their territory by legal means and through the link with other indigenous peoples, explains their lawyer, Ricardo Lagunes. The murder of Juan Vázquez, in March[ii] 2013, did not stop the struggle of the Tzeltales. “The organization is not about taking power. So they cannot so easily buy and destroy them”, says the lawyer. To get access to the ecotourism centre at Agua Azul it is necessary to pass through the ejido of Bachajón. Therefore, since the seventies, the community has located a booth there to sell tickets and obtain some resources for the community. However, “interests were created and the community was divided, with two kinds of authorities: the official and the autonomous, adherents to the Sixth Declaration of the Lacandón Jungle”, the lawyer recalls. The autonomous authorities decided to defend their territory against dispossession, but the state intervened “creating division and making clear the interests of big business”. The dispossession began on February 2nd, 2011, with an eviction by the police. The lawyer for the ejidatarios states that “the resistance of peoples continues with the legal strategy, social mobilization and political statements”, and denounces that the government wants to wipe them out with a destabilizing group. The Secretariat of the Environment and Natural Resources (SEMARNAT) plays an important role in the dispossession of the land, through the Protected Areas Commission. The agency, explains Lagunes, “illegally altered a plan of the Agua Azul area, which was originally allocated to be part of the ejido. This is shown by a decree issued by the Official Journal of the Federation in 1980, which does not correspond to the coordinates of SEMARNAT”. The lawyer reports that despite the 1992 amendments to the Constitution – which attack social ownership of land – ejidos are social territories which are used for defence against large private companies. For this reason, he continues, “the violence is great. The state deploys its economic and police apparatus to infiltrate these people and to try to manage them”. “In Bachajón we are in the legal struggle right now,” said Lagunes, the human rights defender. “We have an amparo[iii] under its second review. We have asked the Supreme Court of Justice of the Nation (SCJN) to consider the case”. The lawyer said that perhaps in six months they will have an answer. The victories obtained in the legal sphere by other peoples, such as the Yaqui tribe and the Wirrárika people, give encouragement to the ejidatarios. “This not only benefits them, but also other peoples,” says the lawyer. The case was also submitted to the Inter-American Human Rights Commission, for dispossession, criminalization and the arbitrary deprivation of the life of Juan Vázquez. The complainants considered that “there are no guarantees to preserve the life of those who defend the territory,” claims Lagunes. The defender alleges that the government of Manuel Velasco Coello is a continuation of the policies of the former governor Juan Sabines, but, he remarks, the assassination of the ejidatario Juan Vázquez Guzmán does mark a before and an after. Following the murder, he recounts, a smear campaign began against the ejido leaders to divert attention from the case. Lagunes recalls Juan Vázquez and how “people sought him out a lot for his skills and abilities to relate to the world of the Caxlanes[iv], to defend and translate the problems of the indigenous communities and to put them on the table of the authorities”. In the six years of the state government of the Party of the Democratic Revolution (PRD), “the repression was strong”, declares Lagunes. The government of Juan Sabines managed “a double discourse on human rights. The governor played a very perverse game portraying himself in the media as a guarantor and protector of human rights, while there were many prisoners in 2008 and 2009”. The lawyer added that “the bodies of law enforcement and justice administration showed their bias and lack of independence in solving these issues”. Bachajón’s lawyer emphasised that the strategies of dispossession are the same throughout Mexico. “The government arrives, divides the communities, buys leaders or ejidatarios, undermines struggles, promotes one group and treats it as legitimate, represses, imprisons and kills those who do not agree with it”, the lawyer denounces. With the death of Juan Vazquez, “the government thought that the people should be calm and quiet, since it was the most visible.” However, the ejidatarios carried on with their struggle, he says. “The organization is not about taking power. So they cannot so easily buy and destroy them”, concludes the man who accompanies Bachajón. Tens of thousands of indigenous protestors and their allies in the southern Mexican state of Chiapas took to the streets on Saturday, October 12. While the date is officially called Dia de La Raza and celebrated as the Latin American equivalent of the Columbus Day holiday in the United States, indigenous Mayans in Chiapas tagged another name on the day: 521 Years of Indigenous, Black, Campesino and Popular Resistance. In different zones of Chiapas, from the cool highlands of San Cristobal de las Casas to the tropical rainforest around the ancient ruins of Palenque, residents blockaded highways and large commercial stores, participated in massive demonstrations and, in the case of Palenque, draped a red and black flag on city hall. A tradition since the hemispheric protests against the Columbus holiday in 1992, this year’s mobilization, or Day of Indigenous Dignity as it is also known, supported the cause of striking teachers and opposition to educational and other reforms promoted by the administration of President Enrique Pena Nieto and his political allies in the Pact for Mexico. In Chiapas, the biggest protest was in the state capital of Tuxtla Gutierrez, where an estimated 50,000 teachers, students, parents, and other members of the public turned out. “This march is headed to the national strike,” was among the chants heard in the streets. Saturday’s action in Tuxtla Gutierrez was widely considered a warm-up to the intensification of nationwide protests in the coming days. Locally, tensions are on the rise. Two teachers Chiapas teachers, Tirso Cruz Yuca and Rodolfo Lopez Toledo, have been reportedly murdered in the past 15 days. Meanwhile, some parents contend that local government officials are offering parents between 100 to 300 pesos to participate in a counter-demonstration planned for October 14. In Ocosingo, Mayor Octavio Albores Cruz accused demonstrators, who numbered an estimated 10,000, of spray painting the city hall and causing property damages. Organizations supporting the October 12 Chiapas protest included the Independent Communities of Ocosingo, Eijdo San Francisco, Our Corn People, the National Struggle Front for Socialism, different offshoots of the historic Union of Unions, and sections of the official National Union of Education Workers and the National Coordinator of Education Workers (CNTE). 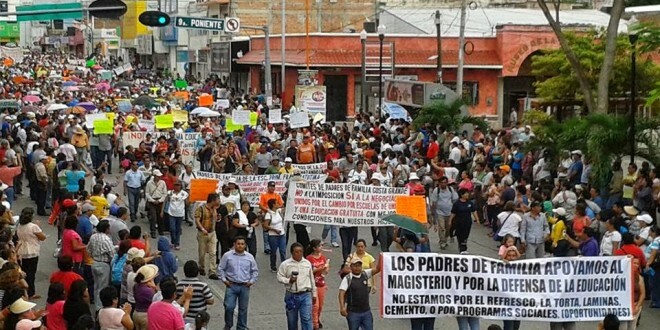 “We declare to the people of Chiapas that this protest action is to express our energetic rejection of the poorly-named education, energy, tax and agrarian reforms,” the organizations said. 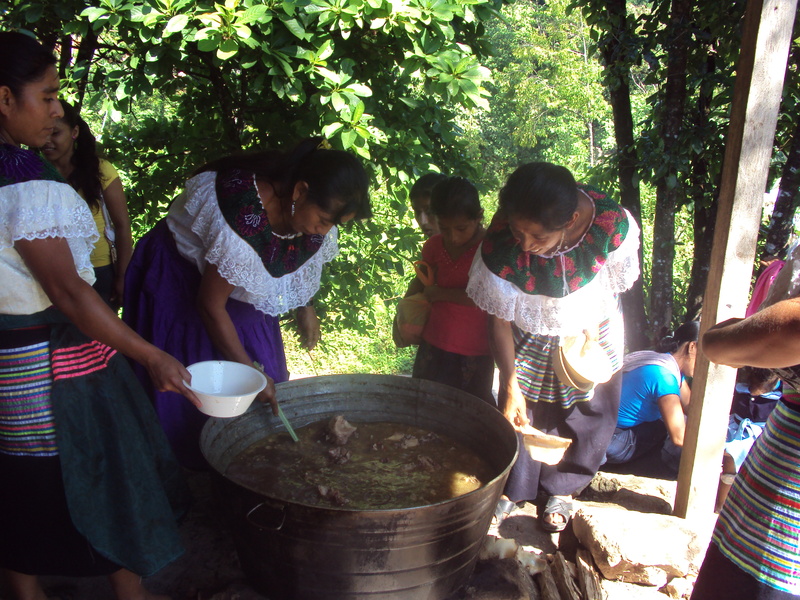 Chiapas was far from alone in commemorating October 12 as a day of indigenous resistance. In the Michoacan state capital of Morelia, hundreds of indigenous students from the Michoacan University of San Nicolas de Hidalgo staged a march from the statue of President Lazaro Cardenas to government offices. Joined by representatives from the CNTE, social organizations and 26 indigenous municipalities, the students called for an end to inequality, exploitation and oppression. Later, the leader of the Zapatista Purepecha Nation elaborated on contemporary indigenous problems and struggles in Michoacan, which include ecological devastation, agricultural decline and the armed self-defense movement against organized criminal bands. Abundio Marcos Prado said the poverty that afflicts 500,000 indigenous Purepecha, Nahua, Mazahua and Otomi people compels their youth to undertake migration as their only employment option. In neighboring Guerrero, cultural activists held an October 12 “Counterfest” in Zihuatanejo, while the Union of Indigenous Residents of Acapulco charged that their members were not getting a fair share of relief aid for Tropical Storm Manuel. The group also joined teachers protesting the educational and other structural reforms. 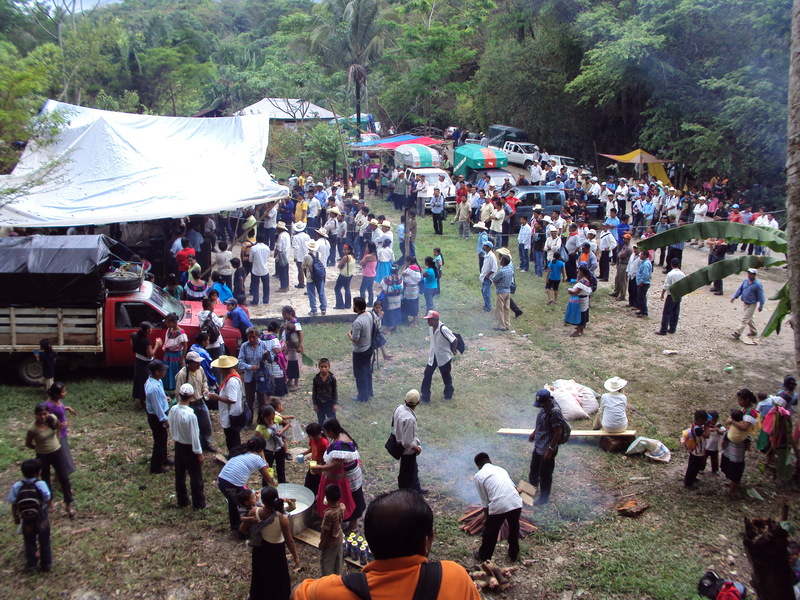 In the Mixteco community of Santa Maria Tlahuitolpepec, Oaxaca, participants of the Second Continental Summit of Indigenous Communication Abya Yala issued a declaration reaffirming self-governance, autonomy, self-determination, and defense of language and culture. The declaration protested the recolonization of indigenous lands by governments, transnational business enterprises and organized crime groups that displace communities for drug production and other forms of resource exploitation. The 1,500 delegates from Latin America, the U.S. and Canada supported the establishment of an inter-continental indigenous portal, endorsed technology that utilizes free software, proposed the creation of hemispheric radio and television networks controlled by indigenous people, and voiced support for the national indigenous uprising in Colombia. The Oaxaca meeting was held in the run-up for the Fifth Indigenous Peoples Summit scheduled next month for Cauca, Colombia.